The Sea-Wolf is a classic bit of American literature that was written in 1904 by American novelist Jack London. The core of the story concerns a literary critic named Humphrey Van Weyden, who is the survivor of an ocean collision of a San Francisco ferry and a freighter. Quite unfortunately for Van Weyden, while he is rescued from a watery grave, it is by a powerful and amoral sea captain named Wolf Larsen who then puts Van Weyden to work aboard his Schooner as he continues his voyage on towards Japan to hunt seals. From the moment of its release the book was hailed as an American classic (selling out almost immediately of its initial printing of 40,000 copies). It also spawned 10 theatrical films (six in the U.S.), as well as three TV mini-series (one in the U.S.). 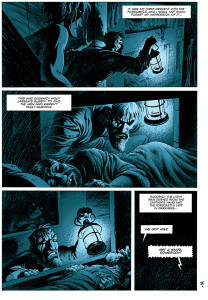 Now this seminal work of American fiction is getting the Graphic Novel treatment from Classics Illustrated from Papercutz. The graphic novel, illustrated by Algerian artist Riff Reb (whose real name is Dominique Duprez). Reb — who was born in Algeria, but moved to France during his childhood — has delivered an amazing adaptation of this timeless story, rendering London’s profoundly psychological adventure with an amazing power and eloquence in 144 pages matching the raw power of London’s original work (no mean feat, to be sure). The power of Reb’s art conveying the helplessness of the upper class Van Weyden (whose name gets shortened to “Hump” for the duration of his voyage) who is held captive on board the Ghost and forced into a hard and terrifying life at sea by the captain. Unused to physical labor, Hump is pressed into service, first as a cabin boy, then in other services as he is promoted up the ranks of shipboard jobs during his “stay.” Needless to say, it takes him quite a while to not only get his sea legs but to learn how to perform the various physical tasks that are thrust upon him. As his forced servitude wears on, Hump discovers that in spite of Wolf Larson’s harsh exterior, he is actually something of a learned man, having read numerous authors and books, including Shakespeare, Tennyson, Poe, De Quincey, and others. Larson, as it turns out, is an individualist, hedonist, and materialist, who simply does not believe in the immortality of the soul. He is a man who finds no meaning in his life (even his own) save for survival and the pleasures of the moment. Furthermore, he has come to not only despise all human life but to deny that it has any value whatsoever. 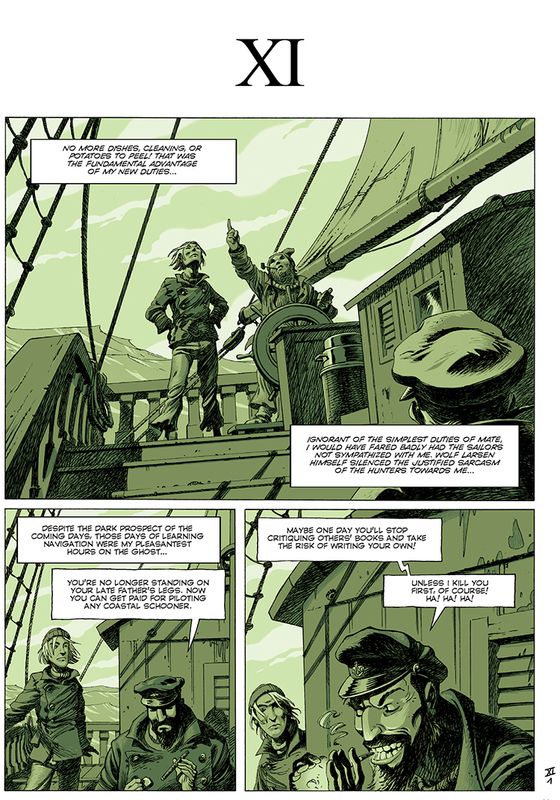 Throughout the course of their travel, Hump and Larson engage in many philosophical (and practical) conversations even as the Captain runs roughshod over the crew and puts down a mutiny, and while seal-hunting. This gives something of a surreal aspect to the story as one would simply not expect a man of Larson’s ilk to be intellectual enough to engage in such conversations. Thus, even as he clearly holds Hump in disregard (due to his dilettante lifestyle) he grants him a good deal of leeway as he recognizes that in Hump he finally has someone with whom he can converse in an eloquent fashion as Hump is so much more his mental equal over the rank and file of the men on board the Ghost. 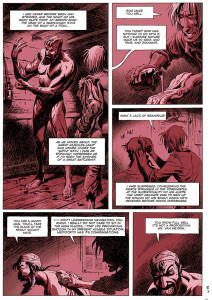 For Rib’s part, he so effectively manages to capture the essence of London’s original story and play it out on the printed page. 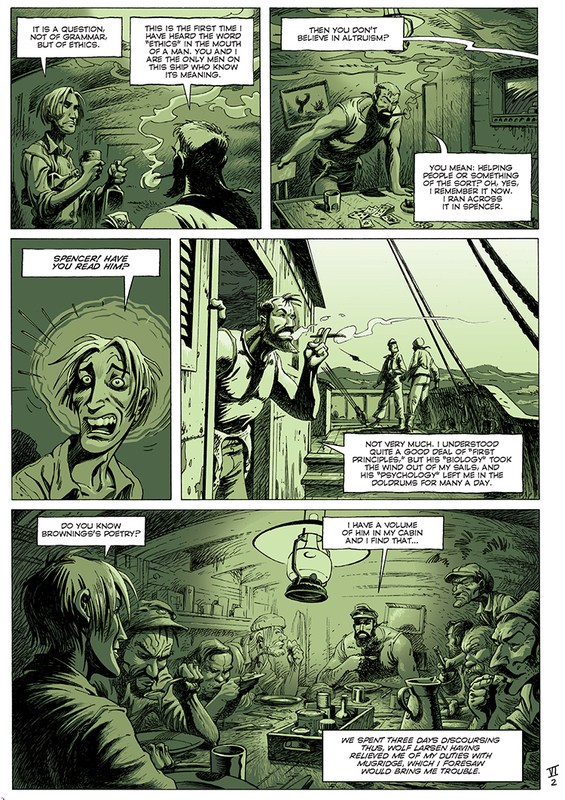 Rib’s unique art style effectively depicts the power of the raging sea as well as time period from which this tale was taken. His style evokes a pseudo wood-cut imagery with cross-hatching and amazing line work. 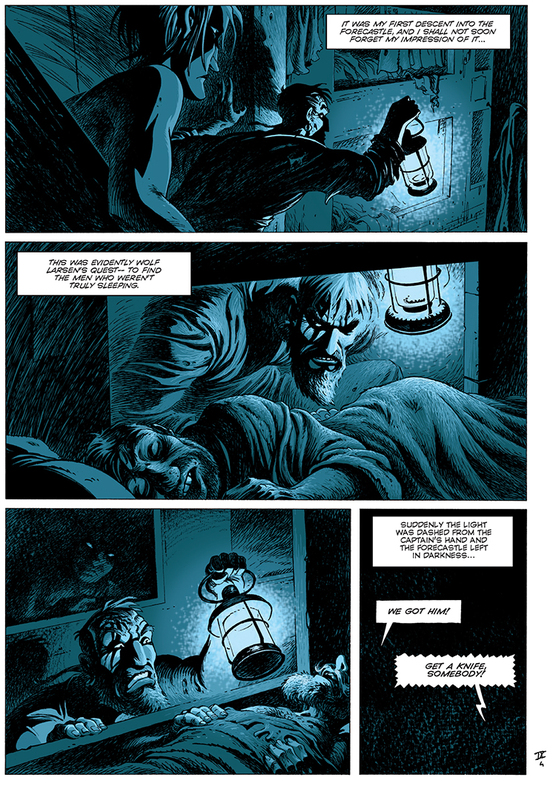 One of the more amazing aspects of the way that Rib chose to illustrate this tale is that his effective use of duotone coloring. 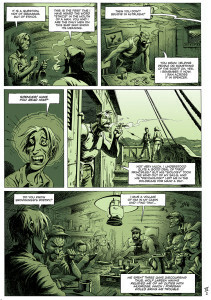 That is to say, each chapter in the book is essentially colored in shades of a single color. Now while elsewhere we have railed against this technique in modern-day comics as we feel that it tends to muddy up the art, with Rib, it enhances the mood, energy, and emotions emanating during each chapter of the book. In the initial chapter the scene is an over-cast blue setting the scene for the disaster to come. Once Van Weyden is aboard the Ghost the color becomes a brownish red, showing us his despair. Subsequent chapters Green, yellow, red, blue, and even black and white, each communicating different energy and emotional content. After a while you don’t even notice that the comic isn’t “All in color” but come to understand that Rib with his art and coloring choices (like London before him with the actual words of the tale) is making very specific statements and observations. 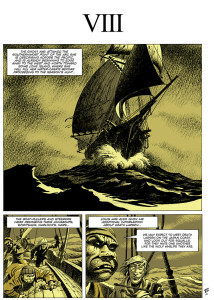 As can be expected with a Classics Illustrated book, the essence of the original work is ideally captured and by the time a female castaway named Maud Brewster ends up on the boat, and she and Hump (as the only two aristocrats within thousands of nautical miles) are forced to rely upon each other and effect an escape with each other, you come to realize that you have just (finally) read one of the books that was perhaps on your school reading list, and (perhaps even against your will) realized how enjoyable the book was. From our own perspective, some of the early passages of the book rung familiar with us (though we have no actual memory of having read the original prose novel). Still, in the pre-internet day prior to Cliff or Sparks Notes, for us, Classics Illustrated comics were a preferred way of ours to read classic tales. Needless to say, that Papercutz has chosen to revive this delightful series, giving them a new lease on life is one of the simple joys of our existence. Hopefully, with this incarnation of London’s The Sea Wolf, (as well as the other tomes in Papercutz growing collection), a new generation of readers will discover those classically iconic stories that were once required reading for all school children. 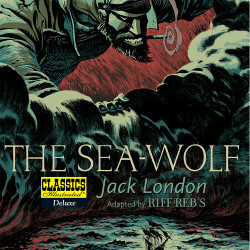 The Sea Wolf by Jack London, Riff Reb’s – Writer and Artist, Joe Johnson translation. Copyright © 2012 MC Productions/Riff Reb’s. Copyright © 2014 by Papercutz, for the English translation, editorial matter, and the collected edition. The Classics Illustrated name and logo is Copyright © 2014 First Classics, Inc. All rights reserved. By permission of Jack Lake Productions Inc. Classics Illustrated is a registered trademark of the First Classics, Inc. The text to Funnybook City is © 2014 Robert J. Sodaro, D.B.A. Freelance Ink. All rights reserved by their respective owners. 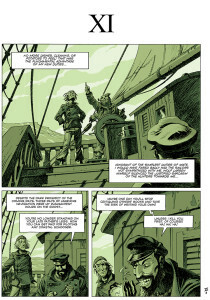 I read London’s The Sea Wolf for the first time about four years ago and enjoyed a lot of it, definitely interested in checking this book out. 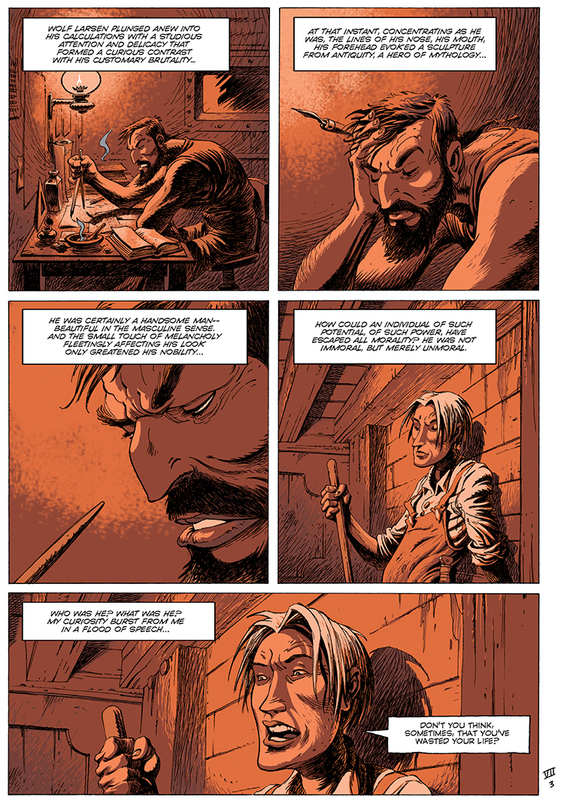 The opening of the book has a lot of interesting visuals in the text, hope the comic has it too.